I have been making basil pesto for a while, but up until recently I had only been using it for pasta. When I came across the idea of using pesto in a dish like tilapia with pesto and roasted tomatoes , it opened my mind to new possibilities. When I was at the farmers market they had big bunches of basil that I just could not pass up on. I was thinking that a whole grain salad with a pesto dressing would be a good idea. At the farmers market I also found some of the first of the locally grown zucchini and they still had some asparagus and my salad was taking form. Since the zucchini and asparagus were so fresh I decided to simply blanch them and enjoy their freshness. I like to complete my salads with beans, nuts and cheese. I was also planning on adding some fresh peas but I completely forgot. This salad was pretty easy to throw together and is was nice and fresh and summery and good! The basil pesto worked really well in the salad the lemon juice brightened everything up. I am looking forward to discovering more ways to enjoy pesto. Cook the farro as directed. Blanch the zucchini and asparagus in boiling water. Mix the basil pesto, olive oil and lemon juice. Toss every thing to mix. Take a look at the No Croutons Required: Herbs roundup at Tinned Tomatoes. Kein, you need to just open a restaurant already, haha :0) EVERYTHING you make is absolutely brilliant and so elegantly plated!! Such a nice meal Kevin. What a great idea for a salad. Farro? Huh? Very rarely do I need to google an ingredient, but hey, there’s always something new to learn. 🙂 Salad looks divine by the way. I love asparagus & zucchini! That salad sounds wonderful. Great blog! that combo salad sure does look good! So simple and yet it makes a lovely composition. Well done. Wonderful salad. I love the combination of vegetables and grains. I have given your blog and award. Please visit mine to claim it. That salad looks amazing! You always come up with the best ideas! Is farro something that is readily available? Can’t remember ever seeing it at the grocery store. new possibilities indeed. what a lovely salad! i find my favourite place to spoon loads of pesto onto is still a thin crust stonebaked pizza…ah! Another terrific recipe! I love the composition of chick peas and zucchini together. 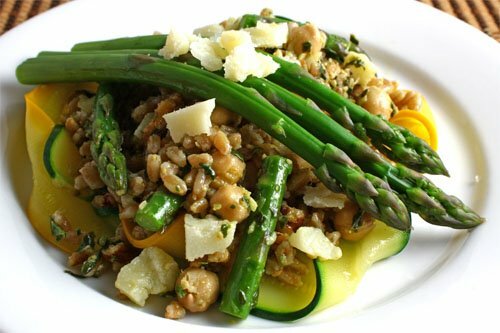 Pecorino romano makes all things with zucchini divine! Yum! I’ll admit I am not quite familiar with faro so your post made me open my eyes and go educate myself a little more about new to me mysterious ingredients:) Your salad looks and sounds delicious and packed with flavor! Nice job, as usual! What a beautiful looking salad Kevin! Really nice! your grain salads are always so tempting! this looks so good. That salad could make a zucchini lover out of me, wonderful. This has to be an absolute winner Kevin. Gorgeous and what a good way to use pesto! This is quite the interesting combination. I like it quite a bit. And it’s certainly something Iwouldn’t have considered. So thank you for the inspiration. That looks so delicious and so healthy! I love farmer’s markets and all their delicious goods. I need to visit them more often, though. I love how reading about other people’s food can open your eyes. Before today, I’d never heard of farro. Now I’m going to Google it. It’s always a pleasure to stop by your kitchen, Kevin. Healthy summer meal. You have lots of good idea and such a good cook Kevin…. I have no idea what Farro is but I will investigate. It looks good tho! Bookmarking this! I love grain salads! i recently discovered farro. good stuff! your salad looks amazing. I love asparagus, and I’m constantly amazed at what you cook and photograph. I’ve passed an award on to you for a creative, artistic and inspirational blog. Thanks for all the ideas and inspiration you’ve given me, and so many others! mmmm, this looks delicious! good use of zucchini…we have far too much of it in the garden at the moment!! Well now I know what to do with these zucchini! This salad is gorgeous looking Kevin! Wish I could taste bit too! Lobster Recipe: It took me a bit of effort to find the farro. I ended up finding it in a small specialty import grocery store. love the greens all over the photo! This looks good too! That is a beautiful salad with, as I can imagine, a wonderful flavor. I am loving all the asparagus recipes you have. do you make anything badly? Looks great. btw, another great grain salad. love it. I have 2 basil plants that are going crazy right now, so this would be a perfect way to use them up! This is a gorgeous salad, Kevin, and it sounds great, too. I still haven’t tried farro, but I need to. Oh I love everything abotu this salad – the colours, textures and flavours! Also, it provides me with a way of using farro (which I’m never sure of what to do with!). Definitely bookmarking this one!